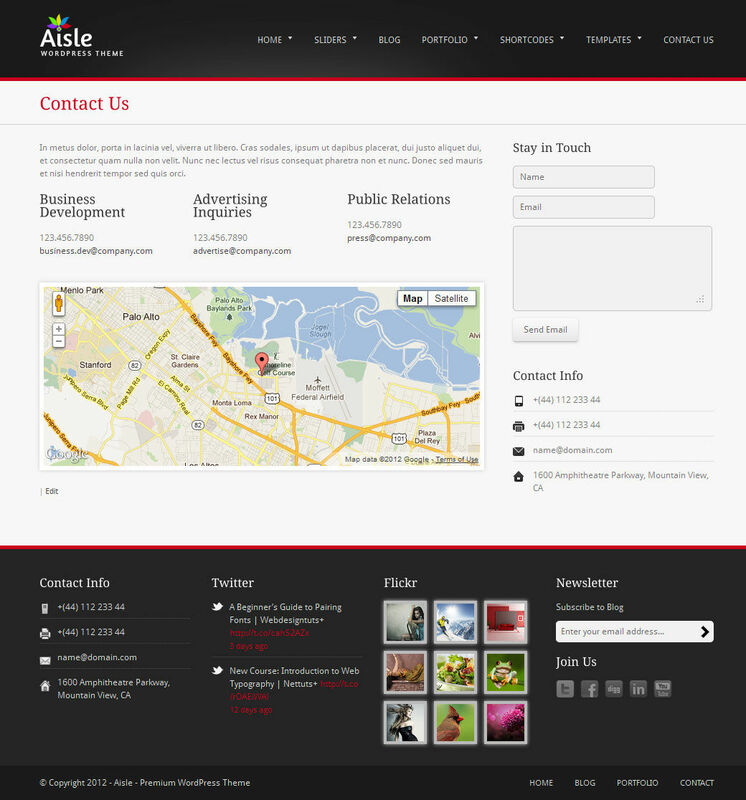 Aisle WordPress Theme made for your Business/Corporate website, Portfolio, or Blog. It’s flexible, you can customize it with the powerful admin panel, which gives total control over many major aspects of your website. Flexible Columns – Write your content with style and in any format with the help of flexible columns shortcode. Styled Boxes & Typography – With the help of the styling and formatting shortcodes you can, obviously, style and format your content in any way. Dropcaps – Drop the first letters of your paragraph in 2 styles. List Styles – Eight styles for your lists. Styled Boxes – Five styles of boxes. Highlighted Text – Highlight your text in 2 different colors. Dividers – Separate any section or paragraph of content with a divider. Buttons – Aisle comes with different styles of buttons. A set of customizable buttons that come in multi colors and 3 sizes for you to choose from. Tabs, Accordions & Toggles – Aisle has tabbed content, accordion content and toggle content. Google Maps – Insert Google maps with ease anywhere in your website pages. Contact Forms – Add a contact form to any page you want. Just make settings to the contact widget and you’re good to go. Any Number of Slideshows possible. 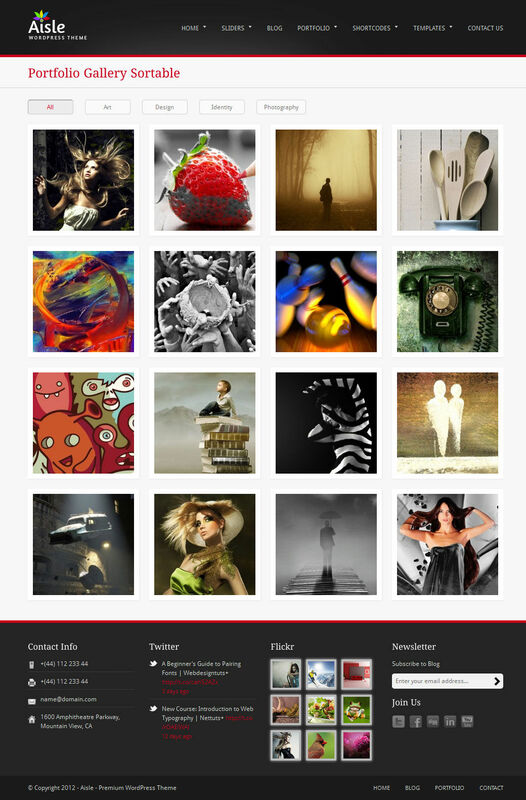 Filterable Portfolio – Supports Images and Videos. No Plugins needed whatsoever, Everything is included within the theme. Aisle is based on 960 Grid System which makes it very flexible and easy to use. Aisle comes with easy to use custom post types for the portfolio, slider and testimonial. The custom post types have options to configure and fine tune every detail just the way you want. Featured Slider – You can add a featured item very easy by using the featured slider post type. 1 Column Sortable Portfolio no Sidebar – Sortable items with text and large image thumbnails with lightbox enhancement with no sidebar. 2 Columns Sortable Portfolio no Sidebar – Sortable items with text and small image thumbnails with lightbox enhancement with sidebar. 3 Columns Sortable Portfolio – Sortable items with text and small image thumbnails with lightbox enhancement aligned on 3 columns. Gallery – Showcase your items in a professional built gallery enhanced with lightbox. 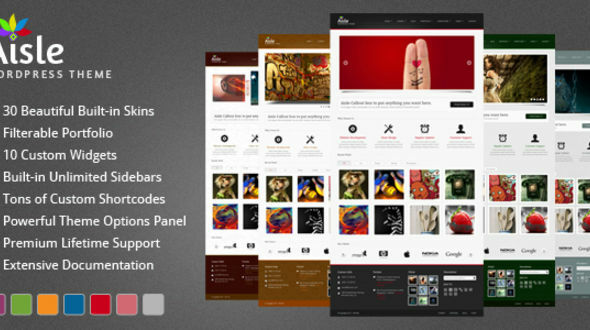 Gallery Sortable /w Isotope – Showcase your items in a professional built gallery enhanced with lightbox and isotope. Testimonial – Display your client’s testimonials with style. If you add the power of the flexible columns sky is the limit when formatting your testimonials section. Built-in Many Shortcodes and Visual Shortcode Editor with Preview function. Preview and Insert them with a click of a button. Aisle covers the various important factors of SEO professionally. It uses valid HTML code and CSS so search engines can index the content of your site with ease. All the page titles, page descriptions and tags are optimized to give you the best possible results in search engines. Headlines are wrapped in heading tags (h1, h2, h3 etc) to signalise their importance to search engines. Thank you so much for purchasing this theme. We’re committed to regularly updating our themes and offering the best possible support on MojoThemes. We’re be glad to help you if you have any questions relating to this theme. No guarantees, but we will do our best to assist.